I’m still playing with the emboss resist technique, hoping to inspire you to get involved in the Simply Irresistible challenge the Foiled Fox and I have happening right now. The three cards I’m sharing today were made from panels left over after teaching a class a few months ago. 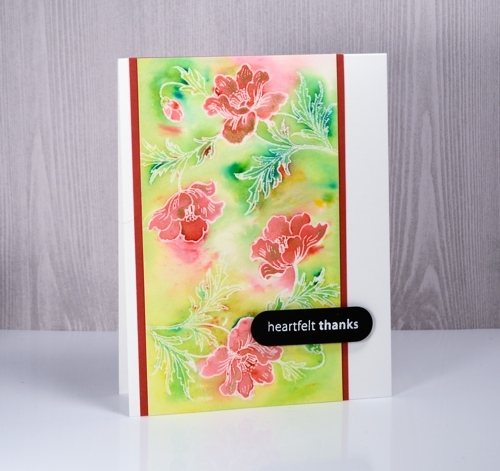 I used gansai tambi paints on the top card and the middle card. 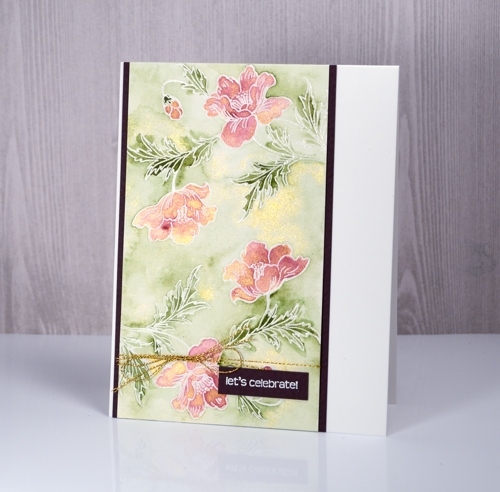 On the top card I added gold shimmer to both the flowers and the petals with some Ken Oliver liquid metal. On the card below I used brusho paints, a red and a green, sprinkled over the embossed panel then activated carefully with water. In places the green and red blended creating some brown/orange tones. 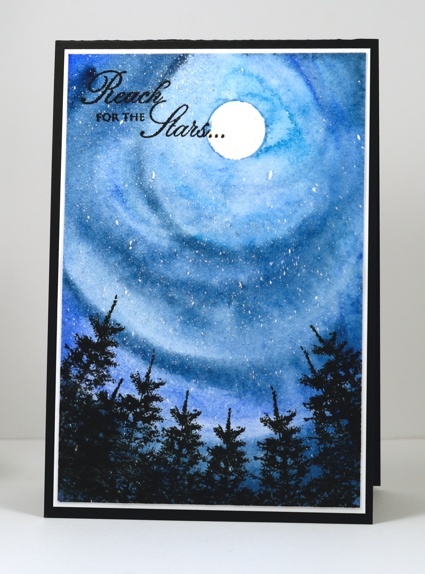 I hope there are a few ideas here that might inspire you to do some emboss resist card making then link it up on The Foiled Fox blog. Do you recognise these trees? 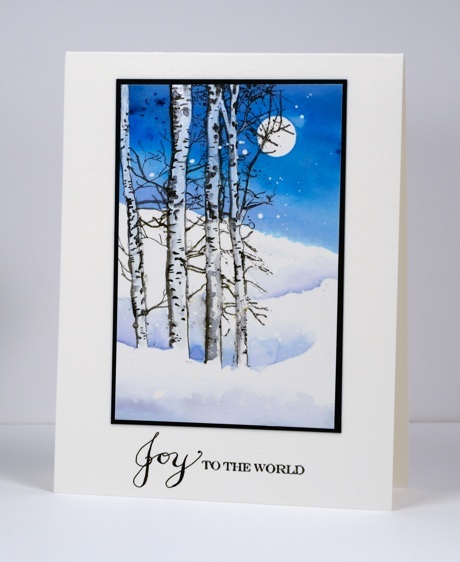 They are part of a larger stamp, ‘Winter Song’ and even though the whole stamp is beautiful I often just want to use that stand of trees on one side. I began by painting a sky over a moon mask using brusho blues. Once it was dry I decided to add these trees and the snow banks. Because the sky was already painted I had to paint the trees in white paint to block out the blue on the trunks. 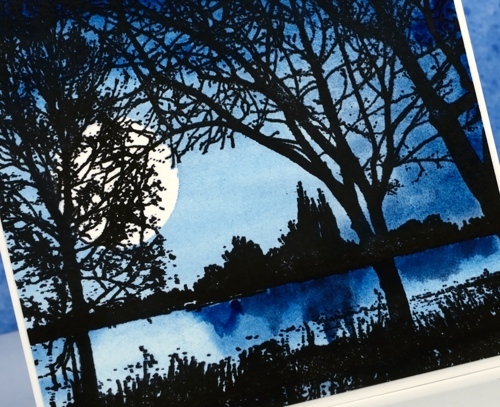 I used the Gansai Tambi white paint and kept it quite thick and opaque. Once I had white trunks to work with I painted some grey shadows on the trunks and added some black spots and twigs with a marker. I used the ‘to the world’ from Holiday Snippets and then hand lettered some joy. I am continuing the journey through imaginative books and stopping in Neverland today. 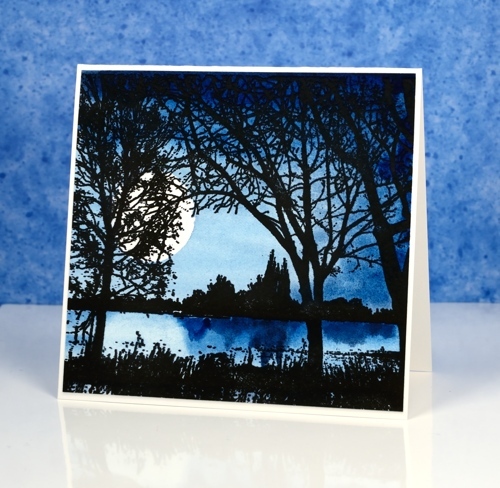 When I was creating cards for the challenge I had to make sure there was a scene or setting from the book I could stamp or paint with some success. In thinking about Peter Pan, a story I enjoyed as a child and read to my children, I remembered this pirate ship stamp and pulled it out for the first time. I also pulled out one of my copies of Peter Pan for inspiration, the one illustrated by the incredibly talented Michael Hague. 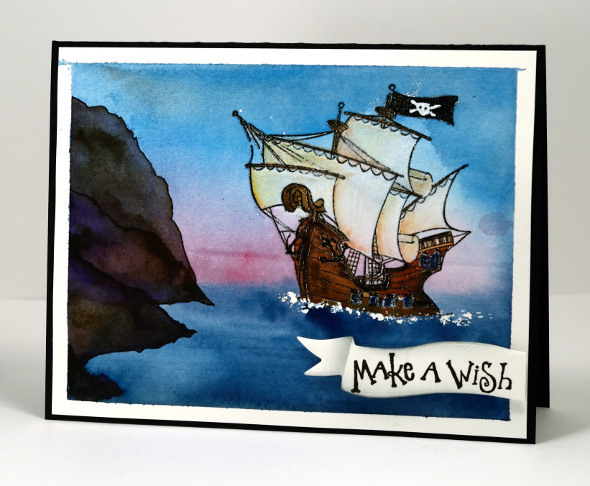 To create this scene I painted some masking fluid where the waves would be then embossed the ship in black. I used watercolour paints to paint the sea, sky and cliffs then concentrated on the ship using paints then watercolour pencils for some finer details at the end. 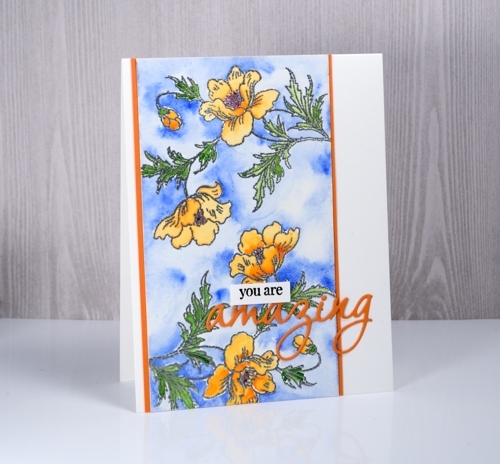 The sentiment is stamped on a die cut banner then trimmed and popped up over the panel. After creating all my ‘story book’ cards I realised the books I chose were all made into movies. Perhaps that is a sign of a good story? I know I loved the books first and sometimes enjoyed the movies later on. It was the whimsical parts of Peter Pan that appealed to me, Wendy sewing on Peter’s shadow, the dog being their Nanna (although I did not get that as a child!?) and a ticking crocodile! I don’t understand it but none of my children seem to have inherited my love for ‘The Lord of the Rings’ trilogy and ‘The Hobbit’. I think they all read the latter but I am not sure that any of them finished all three LOTR. I have read them several times and thoroughly enjoyed them so when challenged with a fantasy and imagination theme the delightful forest of Lothlórien came to mind. I pulled out some tree stamps, some green inks and gold thread to create a representation of the magical forest realm of the elves in middle earth. 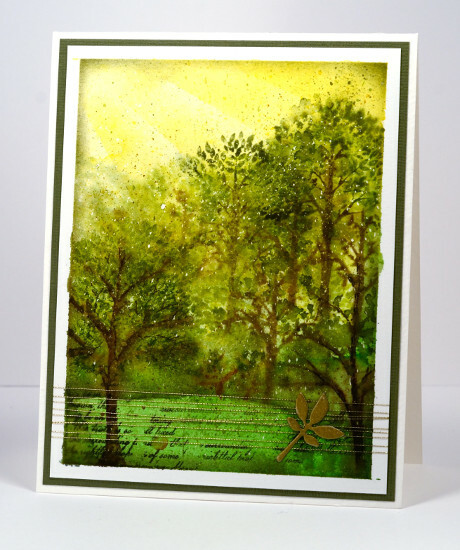 I used some sponging for the golden light of the sky, painting and stamping for the trees and grass and a little gold die cut popped up on gold thread as an embellishment. 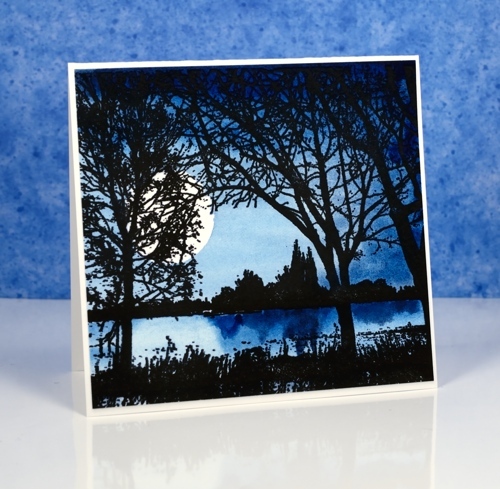 I stamped some of the trees wet into wet to create some misty atmosphere but added some more defined stamping once the paper dried. I think the little bit of script helps give the middle earth look. The speckled look is from a fine splatter of masking fluid applied before I started and removed once all the paint and ink were dry.